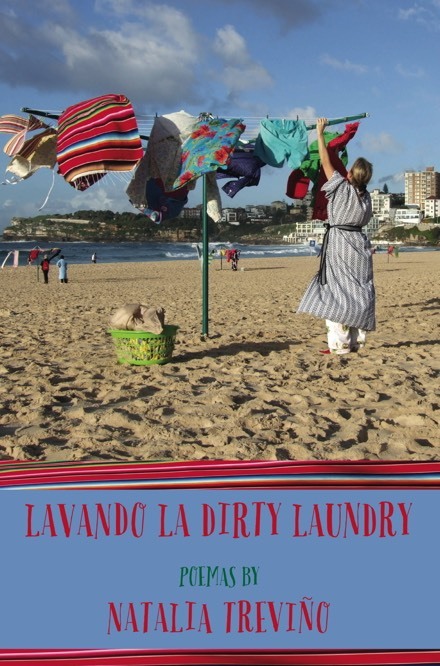 The title of Natalia Treviño's collection Lavando la Dirty Laundry (Norman, OK: Mongrel Empire Press, 2013) is most surely a direct allusion to Ricky Martin's 1999 pop hit “Livin' la vida loca,” but it also recalls Carlos Drummond de Andrade's series “A vida passada a limpo” or “Life in a clean draft,” first published in Poemas (Rio de Janeiro: Livraria José Olympio, 1959).1 Poetry for Drummond is primarily work on language; it does not purify life but does work beyond its details, heightening and clarifying experience by stripping it down to essences. In the series' title poem the moon illuminates both the bedroom it has entered and an obscure corner of the self, stirring dark residues to bloom and superimposing sky, room, and consciousness in a “shimmer of death that recalls love.”2 Treviño's cleaning metaphor, on the other hand, does not work toward metaphysical abstraction but embraces instead the detritus of life, the crumbs swept up, and the significance of the stories these may tell. The prose poem “A Lesson in Elements” (38) explains how atoms seek mates to form molecules that join again to form soap. Soap and water make suds, which join dirt in an eager marriage that undermines the contrast between clean and dirty, taking life all together. Love is like that. I will take your girl, you said. And Raque was yours, Raquenel. This grandmother is the most clearly drawn character in the collection. The speaker, or author's much more modern loves are implicitly contrasted with hers, and the grandmother's homely wisdom often applies to her as well. The volume takes us from a first marriage to a divorce, to a remarriage, the birth of a child and a husband's cancer treatment, often illustrated with references to Greek mythology, the New Testament, or the folktales gathered by the brothers Grimm. A good marriage is like a carefully prepared sauce, we learn in “It Was the Chef Who Finally Explained” (37); a second marriage is like a stew crafted of disparate ingredients, explains “Second Marriage, Stew” (51-52). In a bad marriage the wife, ignored by her husband and his friends and feeling annihilated psychically, seduces him in such a way as to make sure the friends hear her breathe, hoping this will remind them she is a person (“An Ex Recounts,” 5). Before bed, my son told me, You're not you anymore. While I dine on our Phoenix. He always said he wanted to be good to her. Share his life. Stuff like that. three houses away. Where newspapers print, ¡Accidente! Above bright photos of half-bodies, twisted, red metal. they wrap the meat you will eat for lunch. The discernment of consciousness as physical process is perhaps the most interesting aspect of these poems. 1. The translations of Drummond de Andrade given here are mine. Elizabeth Bishop apparently translated this poem as “Life in a New Copy,” in a text I have not been able to see. 3. On conversation poetry see Jonathan Holden, Style and Authenticity in Postmodern Poetry (Columbia: University of Missouri Press, 1986), 33-44. 4. On the prose lyric see Stanley Plumly's classic “Chapter and Verse,” American Poetry Review 7 (January/February 1978): 21-32.